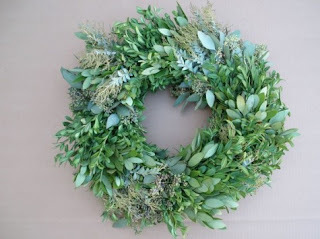 A holiday feature on Blisstree features some excellent ideas for eco-friendly and even edible Christmas wreaths. It’s a pretty and tasty idea. I’m especially loving the thought of this eucalyptus wreath. 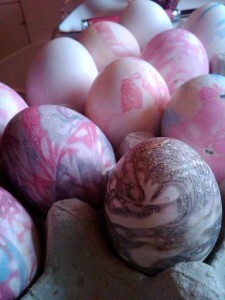 Easter’s nearly upon us all–have you decided yet how you’re going to decorate your Easter eggs? How about dyeing them green this year? Jaclyn Gallucci of the Long Island Press sacrificed her skin and her orderly surroundings to come up with eco-friendly ways to dye Easter eggs–and the results are fantastic. The picture you see on the left was dyed using patterned silk fabric wrapped around each egg and boiled with water and a bit of vinegar. The design is then transferred to the egg. Just look around your house for any old, worn-out silken materials that you can use. Check out the rest of the green dyeing methods now so you can get all the materials ready in time for Easter! For gift ideas, visit Global Giving. To send holiday cards the earth-friendly way, check out ReProduct. It comes with a return envelope so you can send it back. The card and envelope are then recycled into carpeting materials. Driving or flying home for the holidays? Go to Driving Green to offset your greenhouse gases emissions from the travelling and partying.